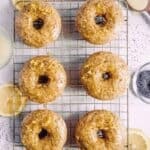 Lemon poppy seed donuts topped with a lemony glaze, baked to a fluffy and moist perfection. In a large bowl, mix together all the dry ingredients: flour, poppy seeds, baking powder, baking soda, coconut sugar, and lemon zest. Set aside. In another mixing bowl, mix together all the wet ingredients: lemon juice, melted coconut oil, vanilla extract, greek yogurt, egg, and milk. Slowly mix the wet ingredients into the dry ingredients, until combined. Grab a gallon ziplock bag and spoon the batter into the bag, push all the contents towards one of the bottom ends, and cut the corner off. In a donut pan, spray with non-stick ensuring to coat all the wells. Squeeze the batter into each donut mold, filling 2/3rd’s of the way. Gently tap the pan on the counter to get rid of any bubbles in the batter and even it out. Bake for 10-11 minutes until the edges are lightly golden brown. Remove from oven and carefully remove using a spoon or butter knife to loosen them out of the pan, onto a cooling rack. While the donuts are cooling, make the glaze. Using a fine mesh strainer, sift the confectioners sugar into a small bowl. Whisk together the rest of the ingredients into the same bowl: milk, lemon juice, lemon zest, and melted salted butter. Once the donuts are cool, carefully grab the bottom of the donut and dip into the glaze. Allow glaze to set for 10 minutes before enjoying.